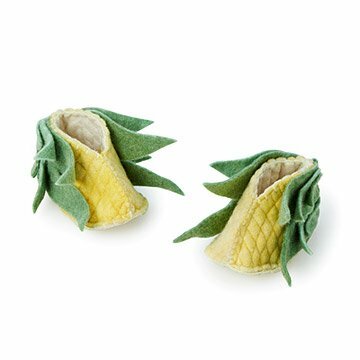 Corny but cute, these fresh-picked slippers add a kernel of wit to your baby's ensemble. Corny but cute, these fresh-picked slippers add a kernel of wit to your baby's ensemble. They're handcrafted by Kyrgyz tailors through the aid of Gulnara Kydyrmyshova, an entrepreneurial local artisan who has helped revive and bring attention to the distinctive handicraft of this recently independent nation and its people. Each pair features felt shorn from local sheep and vibrant stitch-work. Handmade in Kyrgyzstan. Got these two different types of booties for my niece and my nephew's wife who each just had a baby. This is a gift and they may dress the new baby in it for Halloween.